Hi Sue, the timber bench top is actually solid hardwood (American Oak). Kitchen materials - What are the details of the materials used for the cabinetry? Also the floor? Awesome design. Hi Can you tell me the 2 Pac paint colour used for the cabinets? Hi, 2 Pac cabinet colour is monument. It's glass splashback, colour is metallic grey. What colour was the stain? Hello. Can you please tell me what colour paint you have use for the 2 pac cupboards? Hi, the colour is monument. Does the 2 PAC dark finish mark easily? Black stools are beautiful…where can I get them from? I think it was called suite deals. Livingetc Geelong have stools very similar to these. Is it american white oak with oil based poly? Hi Georgia, yes it was stain finish oil base clear coat. HI is the Metallic Grey a Dulux colour? Hi, It might be an Dulux colour, it's from the name of splashback glass sample. Is the extension of the bench natural oak veneer. It looks different. Hi Pam, yes, we used pure white stone bench top. Premium Lighting have similar. WA company but have sellers over east. Hi, It was from Beacon Lighting. island - Could you please tell me if the veneer is followed through onto the sink side of the island? pics dont show opposite side. Cheers thanks a bunch. Yes, the timber veneer is followed through to sink side. Hi, the cabinets colour is monument. Hi, it's 100mm and 60mm. Lights - Would you mind telling me where these amazing lights are from, or were they custom? Thank you! Hi Amy, Those track lights are from Beacon lighting. Hi, yes, the timber floor is Amercian Oak. Hi Tania, It's Asko concealed rangehood. Love the black strip of lights. Can you tell me where they are from? - Really like those spotlights. Would love to know where they are from. Hi, You can get those spotlights from Beacon Lighting. Bench top dimensions - What are the height dimensions from the floor to the timber bench top and floor to the stone bench top? How thick are the timber and stone bench tops? Thanks!! Oversize bench - Hi what is the oversized stone bench manufactured from, and which supplier? Bagnato Architecture & Interiors added this to Timber, Veneer or Laminate: What's Best for Your Kitchen Joinery? How to mix veneer and solid timberA kitchen is an area of a house where families congregate and many tasks are undertaken. This modern kitchen is more than a food preparation area – it’s also a dining space, an area to accommodate the laptop for work (or homework), and somewhere to read the newspaper. The design called for a selection of materials that would accommodate all these uses. Solid American oak timber is the perfect choice for a breakfast bench getting regular use, while a contrasting natural oak veneer for the underside of the island bench and the overhead cupboards is a perfect complement – it provides a different colour in its grain. A durable water-resistant stone has been used for the benchtops and a hard wearing paint finish has been applied to the rear cabinets. Changes to flooringOne of the more common traps for blowing a kitchen renovation budget is the unforeseen need to redo the flooring. The problem occurs when walls and cabinetry are removed, and gaps are created in the flooring. However, even if you have budgeted for the replacement of the kitchen floor, you may also need to consider where that new flooring starts and finishes, especially when we consider that a lot of kitchen renovations also involve the opening up of areas to create an open-plan space. In those situations, the lovely new timber floor for the kitchen may also need to be extended out into the adjoining dining and family areas, otherwise the clashing floor finishes may undermine the whole renovation. The tip is to consider the wider space involved, especially when you are creating new open-plan rooms. 1. Contrasting benchtop materialsSometimes one benchtop material just isn’t enough, and following the trend in mismatched kitchen cupboard doors came contrasting benchtop materials. 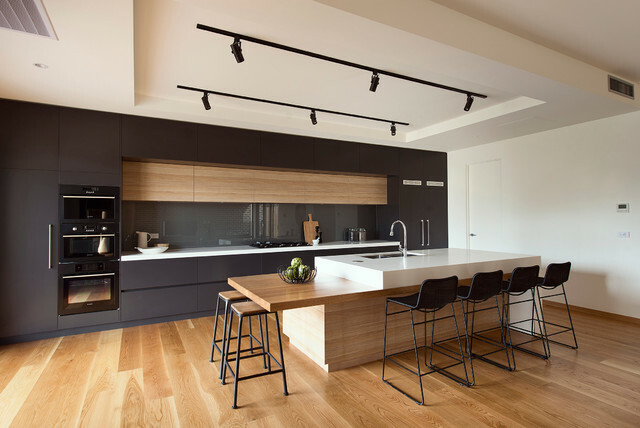 In this kitchen – the most popular kitchen for Australian Houzzers in 2016 – a solid American oak timber cantilevered breakfast bench contrasts perfectly with a durable, water-resistant stone benchtop to create a super-hardworking island designed for cooking and entertaining. Adam Scougall Design added this to Expert Eye: How Much Does a Kitchen Makeover (Really) Cost?